Assessment-based discovery and dialogue learning is the most appropriate approach for adult learning needs of knowledge and service workers. An learning and development methodology that includes personalized assessment information allows the individual orteam to explore the areas of greatest relevance to them while accommodating multiple levels of complexity and different rates of learning. PsychTech has products for self-directed learning as well as for classroom and virtual learning. Many clients use a variety of products to created blended learning solutions. Visit our webstore to see the selection of products available for building custom learning solutions. 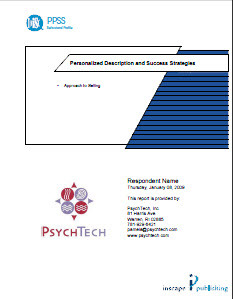 If you would like help in designing a custom learning solution, please contact us at: info@psychtech.com. This General Characteristics report covers: Behavioral Highlights, your DiSC Graph, Behavioral Overview, Motivating Factors, Preferred Environment, Tends to Avoid, Strategies for Increased Effectiveness, Demotivating Factors, Behavior in Conflict Situations, and the Behavioral Tendency Continuum. Supplemental reports on specific application areas can be selected after completing the assessment and generating the General Characteristics. How to Deal with this Person's Decision-Making Style. 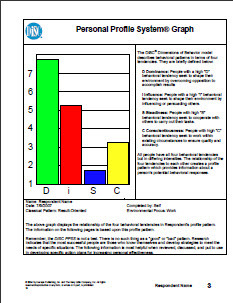 The DiSC Indra Individual Report places your style on a 360° Circumplex Map. This DISC-in-the-Round approach allows you to see what styles are your 'nearest neighbor' and what styles represent the greatest 'stretch' for you. The descriptive report includes an overview of your style, a description of your strengths and behaviors that are least like you, information about Relationship Fit or compatibility with other styles. 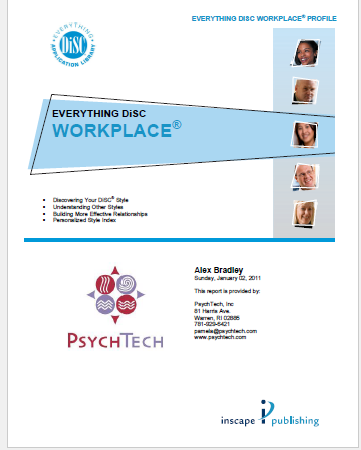 This report uses the DISC-in-the-Round Map with two dimensions" Affiliation and Control. You can learn more about this approach on the Tutorials and Articles pages.